jobs in CG Vyapam Recruitment 2019. Online applications for this Sahayak Shikshak vacancies will be active from 26-04-2019 to 16-06-2019. 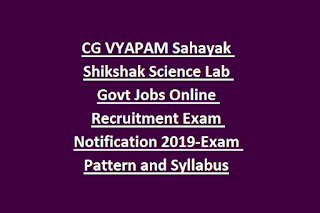 Official website to apply online for this CG Vyapam Shikshak Sahayak Vacancies Recruitment 2019 notification. Exam Pattern and Syllabus for CG Vyapam Assistant teacher jobs will be updated below subject wise. 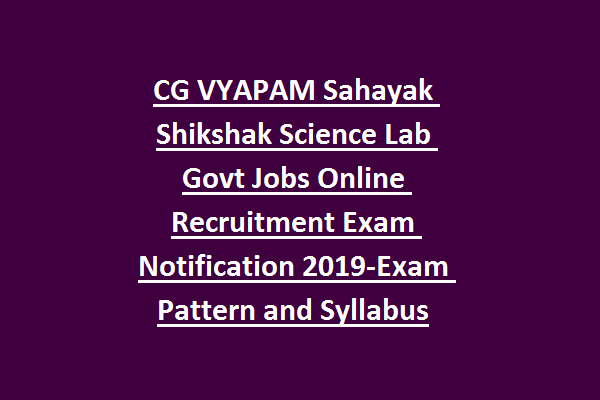 Online application form, selection process, age limits, exam pattern, exam syllabus pdf and other details for this CG Vyapam Assistant Teachers Recruitment 2019 Exam notification. There are total 5506 posts in this CG Vyapam Assistant Teacher vacancy recruitment 2019. As on 01-01-2019 candidates age limits are 21-35 years for general candidates. For reserved candidates upper age limit is 40 years. Candidates who is qualified B.El.Ed or D.Ed or B.Ed Special Education and who qualified CG TET they are only eligible for this Assistant Teacher Agriculture Jobs recruitment 2019. Salary is applicable as per the CG vyapam norms. Candidates selection will be based on written exam for this Sahayak Shikshak (Agriculture) and English Medium/ Hindi Medium School Teachers Jobs. For Science Lab & Hindi/English Medium Schools Assistant teachers written Exam will be conducted for 150 Marks. Candidates who qualified B.El.Ed or D.El.Ed or B.Ed and TET they are eligible to apply online for this Sahayak Shikshak jobs. Official website to apply online is www.cgvyapam.choice.gov.in. Last date to apply online is 16-06-2019. Exam Syllabus PDF, Exam Pattern PDF, exam date, admit card release date, and result and other details will be updated in this website only.